In 1840, the U.S. Mint began the issuance of the world famous Liberty Head Gold Coin design of Christian Golbrecht, in the $2.50, $5, and $10 denominations. Also referred to as the “Coronet Head”, production of these beautiful coins continued up until 1907. However, from 1840 to 1866, Liberty Heads contained no motto above the eagle on the reverse side of the coin. The words “In God We Trust” were permanently added to the coin in 1866. The obverse side of the coin depicts the crowned image of Lady Liberty, surrounded by 13 stars representing the original 13 colonies. On the reverse is the traditional bald eagle image, with a shield on its breast, clasping three arrows in its left talon and an olive branch in its right, symbolizing the power of Congress to bring both war and peace, respectively. The eagle’s head is turned to the right, signaling its preference for peace. The Half Eagle $5 piece holds the distinction of being the only coin of a single design to be minted at seven U.S. Mints: Philadelphia, Dahlonega, Charlotte, New Orleans, San Francisco, Carson City, and Denver. Until 1849, the U.S. Mint produced only $2.50, $5 and $10 coins. 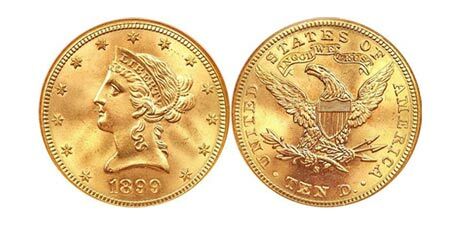 The discovery of gold at Sutter’s Mill and the ensuing California gold rush, however, soon prompted Congress to authorize the mintage of the legendary $20 Double Eagle. In January 1850, the first regular production Liberty Double Eagles were struck. Over the years, this coin was produced in three types. Type I, the “No Motto” variety, was minted from 1849 to 1866. Type II, bearing the designation “Twenty D” on the reverse, was minted from 1866 to 1876, followed by the most common variety, Type III (1877-1907), with “Twenty Dollars” fully spelled out. This historic coin offers the highest gold content of any regular issue U.S. gold coin of its era and possesses one of the most arresting reverses on any United States coin: a dauntless eagle, its wings fully spread. The obverse bears a classical Greek rendition of Lady Liberty. This gleaming keepsake from America’s past reigned as King of American coins from 1850 to 1907 and remains a tangible reminder of our rich, hard-money heritage.